Saugerties, N.Y. – April 16, 2019 At NAB 2019, Camplex, a leading US manufacturer of fiber optic cables and accessories, introduces the new TAC-ALL 12-channel tactical cable with multiple mode fibers under a single jacket. Available with a variety of connector terminations, the stock offering is comprised of six single mode, four OM3 multimode, and two OM1 multimode fibers in a single tactical cable. Fibers can be terminated with LC, ST, or a combination of LC and ST connectors. The cable will also be available on reels. The compact TAC-ALL mil tac cable avoids the expense of separate cables for the use of mixed hardware and cable fiber modes, and simplifies installation and connections. With a cable diameter of 6.5mm/0.26 inches, the rugged, yet lightweight, assembly is ideal for harsh environments in outside broadcast and other applications with limited space, and where deployment and retrieval for reuse is required. 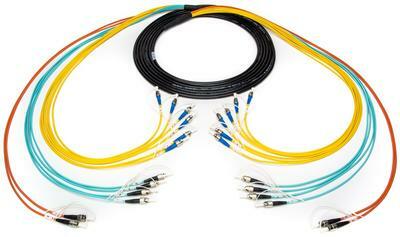 Camplex fiber optic cables are backed by a zero-defect, 100% inspection policy. For more information go to www.camplex.com.